EXPLORE THE 3RD GRADE CURRICULUM. A strong math program begins long before third grade at Wood Acres, so these students again reap the benefits of a well-planned and researched program blending basic math operations, problem solving, and applied math skills. The curriculum provides students with a handbook for reviewing essential and previously taught skills as well as well-presented instruction in place value, problem solving, operations and math facts, measurement, time, geometry, fractions, decimals, multi step multiplication and division, percentages and pre-algebra skills. Life skills math such as brain builders, estimating, and mental math help students get sharp and stay sharp mathematically in school and out. Interconnecting the tools of language arts and mathematics to the content areas of science and social studies takes center stage in third grade and continues consistently until the completion of Upper School. The positive impact of Wood Acres Core Knowledge based social studies curriculum cannot be overstated. Parents, teachers, and students are engaged in learning about a broader range of topics with a deeper investigation into how history and geography play into our world today. From a study of our neighbor to the north, Canada, to world rivers, ancient Rome, and the Vikings, the social studies curriculum for third grade also emphasizes citizenship and character. Learning is enhanced through field trips, projects, and research on related topics. The Wood Acres School’s groundbreaking science curriculum is ready for young scientists in third grade. This curriculum literally leaps from the mind-numbing “read the chapter and answer the questions” approach to a hands-on, experiential laboratory setting that will have third graders learning and living the scientific process. Taught through integrated CELLS (Core Experience Learning LabS) curriculum modules provide in-depth study of topics in areas of matter, electricity, the human body, and our solar system. The science-math connection is strong throughout the program and provides third graders with the initial tools to embrace science as a favorite subject. With Wood Acres’ Spanish program beginning with three-year-olds, the student of Spanish in third grade is becoming more comfortable with both conversation and grammar components. Taught by a formal curriculum imported from Spain the acquisition of foreign language skills is outstanding at Wood Acres. Instructional methodology includes TPR, total pupil response, which encourages students to become active speakers, listeners, writers, readers and singers in the Spanish language. Third graders are interested in both team activities and individual physical challenges and the PE curriculum for them is based on these dual loves. Pre and post testing in many areas of physical fitness have students working throughout the year on improvements in running, stretching, strength, and endurance. Intermittent team games help both skill development and team spirit in the physical fitness unit. Gymnastics, soccer, fitness units, and games are all enjoyed throughout the year. 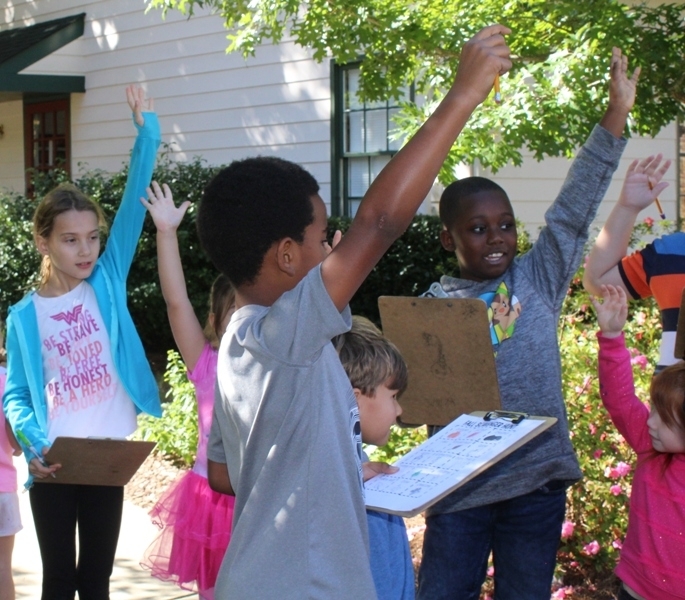 Taught by an accomplished artist in her own right, the Wood Acres art program for third graders is a natural continuation of rich curriculum of the second grade. With an ever-refined eye for line, form and perspective third graders blend didactic instruction with creative, edgy and captivating art projects. Students are trained to look at the world through the eyes of an artist, seeing lines of symmetry, perspective, geometry, color, balance, shading, tone, and depth as the art of nature and man’s creation. Picasso would be proud if he visited the bi-annual student art shows on campus. Blending the methodology of Kodály, Orff Sherwelf, and Musikgarten, the Wood Acres music program helps create students who become educated audiences as well as engaged performers. Musical behavior is basic to all cultures, be it primitive and sophisticated. Program goals focus on comfortable and accurate singing, comfortable and accurate moving, and expressive sensitivity when listening and/or responding to music. Music at Wood Acres is both an art form and a language or method of communication often referred to as Conversational Solfege. Students read music, perform with school instruments, and learn about the culture surrounding the music they study. With this background, students become informed, appreciative, and enthusiastic audiences at the symphony, opera, or a rock concert! Technology is becoming as common in a third grader’s life as food and friends. By honing computer skills from keyboarding, to Microsoft Office skills, to responsible Internet use, third graders at Wood Acres learn how technology enhances all teaching and learning. A technology specialist meets regularly with classroom teachers to plan projects that relate directly to academic areas in the third grade curriculum. Third graders will work on creative writing in the lab using Microsoft Word during one lab period and then publish their corporate work for our library in the next. Students also spend time in the STEM lab, known as the HIVE, building Kano computers and programming.